Maximo is Venezuelan, tattooing since 1996. his style is a mixture of sacred geometry, surrealism and optical art. He also does a little watercolor and Japanese. Click on his photo to check out his portfoilio! John is a versatile artist with a broad array of skills from American traditional to black and grey realism. Click on his photo to check out his work! Darryl has been tattoo for 6 years specializes in black and grey but considers himself a well rounded artist. Trison has been tattooing for over 9 years and ranges in variety of styles from new school to black and gray. Teej is well rounded and versatile in all areas, but he mainly enjoys doing coverups and putting color tattoos on people of color. Click on his photo to see his work! Austin has been tattooing for 3 years and is well rounded in all styles but prefers bold lines and bright colors. Click on his picture to check out his work! JJ tattoos mainly in the traditional/neo-traditional style of tattooing as of lately, however, he does not limit himself to any particular style! He loves trying and practicing other styles and loves tattooing as an art in general! Click his picture to see his work! Justin is known for his color work but prefers realistic black and gray with minimal outlines. Click his picture to see his portfolio! Anthony's style ranges from neo traditional to realism, to traditional, black and grey is what he specializes in but he likes to be a jack of all styles. Click on his picture to see his work! Bree's style would be considered illustrative blackwork, click on her picture to see some of her work! Scott is a Australia based artist who's preferred style is black and grey realism but he also enjoys doing color tattoos and Mandalas. Click on his photo to see some of his work! David specializes in black and gray portraits and macabre style work but is also versatile in many other styles of tattooing. Click on his picture to check out some of his work! Michael mainly does black and grey work, but can and will do color of any style. Click on his photo to see his work! Bryon is a versatile artist who loves doing all styles. He prefers mostly black and grey but really likes working with color as well. Click on his picture to see his work! Josh focuses mainly on being a well rounded tattooer. If he had to say he had a style, it would be solid tattoos that are going to last no matter what. Click his picture to check out his work! Bryan enjoys tattooing any tattoo style with bold outlines. Anything with a traditional feel is his favorite to tattoo. Click on his picture to see his work! Marz Rickey, the manager and one of three artists at Providence Ink in Port Clinton Ohio-- his expertise include color, black and grey realism as well as as the bold lines and bright colors associated with American traditional and Neo traditional. Click on his photo to check out his work! AKA Boston Eddie, has been tattooing for 15 years. Located at Body Art Gallery in Tulare, California. Click on his photo to check out his work! Ben has been tattooing for over a decade and prides himself on his fine line work. He has an affinity for Asian pieces but has tattooed it all. Ben opened Mile High Ink in Golden, CO 6 years ago and his shop has taken top three and two first place awards for Best Tattoo Shop in Denver. Click his photo to check out his work! Johnny resides in Spartanburg, South Carolina. You can find him in his true form, tattooing away at The Gallery Tattoo. Johnny has been tattooing since 2008 and specializes in black and grey realism. Click his photo to check out his work! Matt started tattooing professionally in 1999. He describes his style as a mash-up of new school, oriental, and realism. Click on his photo to check out his work! Paul has been tattooing since 2014. He enjoys tattooing all styles from realism to American traditional. Click his photo to check out his work! Nathan is a versatile artist that can tattoo a wide range of styles. He specializes in realism, portraits, and 3D. Nathan is based in the UK but travels around the world developing new techniques. Click his photo to check out his work! Bryan focuses on realistic works both full color or black and gray. Click his photo to check out his work! Victor has been tattooing for 8 years. His style is described as new school mixed with black and grey. Victor enjoys tattooing all styles such as neo-traditional and cover ups. Click his photo to check out his work! Aaron is an award winning artist tattooing consistently for about 3 years . He tattoos vast array of styles from bright bold neotraditional to fine line black and grey/realism . Click his photo to check out his work! Wes has been tattooing for 6 years. He is the owner and operator of Gypsys Kurse Tattoo Parlour in Hull, England. His style is primarily black and grey but he also has an affinity for Japanese work and will do any style requested. Click his photo to check out his work! Big Will likes to do any tattoo style requested of him but his passion is black and grey. Click his photos to check out his work! Andrés is a Costa Rican tattoo artist. His specialty is Japanese and Blackwork tattoos with great interest in Black & Gray and Realism. Click his photo to check out his work! Kelly is not only a tattoo artist, body piercer but also the owner of Ruthless Tattoo & Piercing Studio in Winchester, TN. She specializes in intricate linework and watercolor style tattoos. Click her photo to check out her work! Brian is a self taught tattoo artist with a focus on traditional nerdy tattoos. He likes to challenge himself by undertaking new styles and expanding his technical knowledge. Brian is also a combat veteran with two degrees in Graphic Design. Click his photo to check out his work! Mike has been tattooing just over 2 years. He is well versed in most styles but prefers black and grey. Mike especially loves to work with anything dark and creepy or surreal. Click his photo to check out his work! Caleb is a self-taught artist with 4 years of experience. He favors horror and black and grey but also enjoys new school traditional. He focuses on original sketches and artwork. Click his photo to check out his work! Rasmus is an artist from Denmark. He has been tattooing for 6 years and likes to do any tattoo style but loves to do black and grey. Click his photo to check out his work! Louie’s foundation was built by black and gray work, but he is not limited to any one particular style. He prefers to focus on the needs of his clients, and love for the industry. Click his photo to check out his artwork! Hannah's style of tattoo are primarily neotraditional and watercolor. Some of her favorite tattoo subjects are floral, gamer, and graphic novel related. Click her photo to check out her work! Vitt is based out of Anaheim, California. He is a self taught artist who loves to do all types of tattoo styles but his favorite is black and grey realism. Click his photo to check out his work! Natalie has been tattooing for about nine years, first as a cosmetic tattoo artist then in Para Medical Tattooing training in Canada. She specializes in scar camouflage, areola reconstruction, birthmark camouflage, and still enjoys cosmetic tattooing as well as small art pieces. Natalie recently had the privilege of being photographed to be a part of Justice Howard's book "Renegades". Click her photo to check out her work! Rich Parker is a 13 year tattoo artist. He specializes in new school color tattoos, but also skilled in bold black and gray as well as other vibrant color styles. His work is inspired by a love for graffiti, anime, and other forms of pop culture. Click his photo to check out his work! Michael is a versatile tattoo artist/illustrator based out of southern Arizona. He is particularly known for his high contrast black work, dot work, neo traditional tattooing, and color work. His artistic background and dedication to the fundamentals of tattooing as well as craft allow him to design and execute unique and timeless tattoos. Click his picture to check out his work! Marah is an artist Artist from small town Marysville Ohio, and works in Bellefontaine, Ohio. Specializing in color and more specifically water color tattoos. If you’re looking for fun bubbly and girly-- she's the artist the for you! Click the picture to check out her work! Brandon is a spiritual artist that loves sacred geometry and dot-work tattoos. He loves anything that’s is detailed black and grey. A firm believer in tattoo therapy SLiC ink listens intently to the clients request and doesn’t disappoint. Through meditation he uses his techniques to bring a calm positive mood to your tattoo & session. Click his photo to check out his work! Marceau has been tattooing since '99 and has tattooed across the US and internationally as well. His primary work include fine line floral and watercolor. He and his wife own Anchor & Rose Tattoo Co. in Tulsa, OK. Click on his picture to check out his work! Clabe Rising Sun specializes in bright, bold, traditional, neo traditional, and dot work. He tattoos out of Tulsa, OK. Click his photo to check out his work! Jaki has been tattooing for 7 years and specializes in illustrative/neotraditional/black&grey realism tattoos,but is open to most styles. She gathers inspiration from Renaissance art, gothic architecture,and all things weird/obscure. Click her photo to check out her work! Aaron’s tattoo style varies from hyper realism to neo-traditional, and pretty much everything in between. He’s been tattooing for 7 years in Washington, and is passionate about making each tattoo better than the last. Click his photo to check out his work! Bekki has been tattooing for just under a year and is the owner of Vintage Ink Tattoos in Birmingham, UK. She loves tattooing color pieces as well as black work designs. Her goal is to progress in an illustrative style. Click on her photo to check out her work! Matt has been tattooing since 2009. His favorite style is realism but overall does enjoy a lot of color work as well as watercolor and black and grey. Matt doesn’t like to be tied down to one particular style, he loves it all and all aspect of it. Click his photo to check out his work! Rey is an artist out of Houston, Texas. He has been tattooing professionally for about 3 years. Rey specializes in script and black and gray realism, considers himself a pretty versatile artist and can do it all. Click on his photo to check out his work! Minion is an award-winning artist specializing in traditional and color work. He manages and tattoos at Delta Ink Tattoo Parlor in Indiana, but travels to tattoo at conventions around the country. Click his photo to check out his work! Jason is a 2nd generation tattooist in his 11th year working professionally. He enjoys black and grey realism and Japanese styles but prides himself on tattooing anything that walks through the door. Jason stays busy working conventions year round and have won awards for his oriental work. Click his picture to check out his work! Mat is an Ohio based tattooer, professionally tattooing since 2015. You can find him at Resurrection Tattoo & Fine Art in North Canton, Ohio. He enjoys all styles of tattooing, but prefers to do smooth, solid saturation and bold lines. Click on his picture to check out his work! Justin has been tattooing professionally for the last 3 years. He prefers fine lines with smooth blends and specializes in black and grey realism and illustrative works but he also tattoos a bit of everything. Click his photo to check out his work! Taelor enjoys doing black and grey realism/ dark art tattoos, but is more then happy to accommodate any style. He tattoos at Cream City Tattoo in St. Cloud, MN. Click his picture to check out his work! Jake has been tattooing since 2009. He is the owner of Resurrection Tattoo and Fine Art in North Canton, Ohio. Jake specializes in black and gray as well as color realism. Click his picture to check out his work! Jesse has been tattooing since 2017. He enjoys tattooing anything horror themed, cartoon, neotraditional as well as black and grey. Jesse is well rounded in most styles but enjoys color the most for the blending. He is more known for his brighter color works. Click his photo to check out his work! Anthony is a tattooer and owner of ASC INK from Montreal Canada but is currently tattooing in the Ottawa west area. He prefers to tattoo big realistic animals and portraits but is well versed in all styles. Click on his picture to check out his work! Rodney has been tattooing professionally since 2016. He currently located at Ink Link in Gastonia, NC. Rodney enjoys tattooing portraits, custom script, and painting styles. His military background has instilled in him hard work and dedication. Rodney is very passionate about what he does and is always craving to learn new techniques. Click his photo to check out his work! Cody has been tattooing since 2012, and is a resident artist at Scarecrow Ink Tattoo in Chilliwack BC Canada. He is most known for his linework, custom script and blackwork style pieces. Cody has been known to do realism pieces and has an affinity for neo traditional. He tries to take on pieces of all styles to constantly learn and better his skills and career. Click his photo to check out his work! Scott has been tattooing since 2016. He is based out of Acid Works located in Grand Blanc Township in Michigan. Scott is known for his bright colors and bold lines with influences in new school and illustrative styles. Click his photo to check out his work! Colby has been tattooing since 2008, he is a self taught tattoo artist from Moncton New Brunswick Canada. He specializes in black and grey realism, animals, and portraits. Colby also does freehand custom fonts, freehand black and grey skulls and Neotraditional but enjoys doing any style. Click his photo to check out his work! Mindy tattoos at Your Mom’s Tattoo Atelier in Bemidji, MN. She likes doing traditional, neo traditional and lettering but lately has been loving the watercolor style! Anything with crispy lines is her jam! Click her photo to check out her work! Chilly has been tattooing for almost two decades, he’s currently tattooing at Prodigal Son Tattoo in Enterprise, Al. He doesn’t claim any one particular style; the variety is one of many things that keep him motivated to evolve. Ultimately, he likes the tattoo to invoke a positive feeling in the person wearing it and in everyone who sees it. Chilly tattoos in about every style, whether it's elegant black and grey, color-bomb neo or soft portraiture, as long as it isn't vulgar, overtly demonic or 1986 tribal. Click his photo to check out his work! Claudia has been tattooing since 2011. She currently tattoos out of Forever Ink in El Paso, TX. She is a black and grey/geometric award winning artist. Claudia’s preferred style is black and grey, she also likes working on vibrant color and watercolor pieces. She enjoys the challenge of line-work, dot-work, and doing tiny tattoos. Click her photo to check out her work! Matthew has been tattooing since 2011 in Tri-cities WA. He specializes in neo traditional black and grey, American traditional, cover ups and freehand work. Click his photo to check out his work! Jason is a St Louis Missouri based artist who has been tattooing since 2014. He enjoys all styles of tattoos but favors making Black and Gray tattoos, Freehand lettering tattoos, and illustrative line work tattoos. Click on his photo to check out his work! Ken has been tattooing since the late 90’s. He’s well versed in all styles. He’s a big fan of bright color and high contrast black and gray works. Ken is currently located in Tucson, Az at 4forty4 Tattoo. Click his photo to check out his work! Niko has been tattooing since 2014 and is from the island of American Samoa. He tattoos in various styles but Contemporary Polynesian Tattoos are his specialty. Niko’s goal in tattooing is to instill a better image of "TRIBAL" tattoos to the public. Click his photo to check out his work! Alex has been tattooing professionally since 2015 and owns the shop Humblebee Tattoos in Cedar City, Utah. He specializes in photo realism as well as black and grey. Click his photo to see more of his work! Eric is a self taught artist, tattooing since 2010. He is currently working at Color Bomb Tattoo Shop in Bainbridge Georgia. Eric loves doing black and grey work, watercolor, as well as color infused black and grey. Click his photo to check out his work! AL-X is a well rounded artist, tattooing and piercing since 1998. His specialty is to repair old, poorly done tattoos and cover-ups of unwanted tattoos. AL-X enjoys seeing how happy his customers are with their new, improved tattoo. Click his photo to check out his work! Josh is a second year tattooer in South GA. His focus has been mostly studying black and grey but also loves a little neotraditional color style. Click his photo to check out his work! Ghost has been tattooing for 2 years. He tattoos out of "Your Mom's Tattoo Atelier LLC " in Bemidji, MN. Ghost is a very versatile artist, proficient in any style, but really enjoys doing realism and portraits. Click his photo to check out his work! Rampage has been tattooing since 2013. His style ranges from New School, Dot Work to Japanese. He tattoos at Jekyll & Hyde Tattoos in Caerphilly, South Wales, UK. Click his photo to check out his work! Jo is a self taught artist and owner of The Wakkie Ink Co in Wiltshire, UK. She is a versatile artist and loves doing styles that are different. Click her photo to check out her work! Tony has been tattooing for 8 years. He prefers to do black and grey realism pieces and cover ups. Tony also loves learning new methods of tattooing. Click his photo to check out his work! Austin tattoos out of Anchor & Rose Tattoo Co. in Tulsa, OK. His style is psychedelic neotraditional. Austin focuses on clean linework with solid bright colors and also enjoys doing black and grey work. Click his photo to check out his work! Stuart has been tattooing professionally 8 years. He enjoys all styles but when given the opportunity to do his own style, he goes for black work, water color style with some deep thoughts entwined with the design. Click his photo to check out his work! Lyndon has been tattooing since 2008. He enjoys tattooing realism designs as well as traditional and neo traditional but will do any style asked of him. Click his photo to check out his work! Mikey has been tattooing since 2001. He co-owns The Ink Company Tattoo Studio in Harriesburg, MS and has been there the last 11 years. Mikey is a fairly diverse artist but specializes in bio-organic and custom black and grey work. Click his photo to check out his work! Jeremy has been a tattooer since 2007 and is currently working at Artistic Encounter in Dallas, TX. His specialty is sacred geometry. Jeremy’s passion is scalp micro pigmentation, which is used to help with many forms of alopecia, male pattern baldness, scar camouflage, and many other cosmetic applications. Click his photo to check out his work! Drew has been tattooing since 2015. He enjoys tattooing in all styles but mainly prefers black and grey. Realism and horror themed pieces are his favorite works. Between keeping myself available for walk-ins and scheduling appointments throughout the week, the tattoo ship is basically a home away from home for him! Click his photo to check out his work! Jessica has been tattooing since 2008 and specializes in color and coverup work. She dabbles in a mixture of illustration, watercolor and almost neotradtional, Jessica calls it her “strangeworks style”. She also really does like to tattoo all different styles. Click her photo to check out her work! Mikey has been tattooing for 5 years. He was born and raised in California and tries to bring that style into everything he does, from lifestyle, to art and everything in between. Mikey is well versed in most styles which came from starting in a walk-in shop. His first love is graffiti, so really he enjoys anything with drop shadows or dimensions. Currently, his main focus is black and grey realism, as well as realistic spiders and insects. Click his photo to check out his work! Keith has been tattooing for almost 4 years. He loves doing various styles of tattooing and combining them together. Click his photo to check out his work! North Alabama based artist focusing mostly on high contrast black and grey photo realism/surrealism and anything that creates flow! Click his photo to check out his work! Audrey has been tattooing in the Chicagoland area since 2013. She specializes in black line work and dot work. Click her photo to check out her work! Wicked is a versatile Tattoo artist who enjoys and is competent in many styles. From realism, black and grey to neotraditional, tribal and Japanese. Art is not just something Wicked simply does, but rather, who he is and how he lives. It’s a love and a passion. When not tattooing, you will probably find him painting. Click on his photo to view his work. After a 2 year apprenticeship, Josh started tattooing in 2013. He likes tattooing all styles but tends to do more bright colored pieces. Traditional, neo-traditional, and new school are his preferred styles. Click his picture to check out his work! Killian has been tattooing for 3 years. He enjoys doing bold traditional pieces with intriguing color palettes. Killian also enjoys doing dotwork and pepper shading techniques for more of a blackwork style. Click his photo to check out his work! Stoke is a black and grey artist that is very diverse. He has been tattooing for 8 years professionally out of Denver, Colorado . He specialize in portraits, semi realism, letting/script an small water color. Nowadays you can catch him at Nocturnal Tattoo or traveling the country working conventions. Click his photo to check out his work! Timmy Bee is an award winning artist based out of Michigan, tattooing since 2001. Though versatile as an artist, he specializes in bold/new school colors and neo traditional. Click his photo to check out his work! Steven is well rounded and versatile in all areas, he mainly enjoys Japanese style as well as black and grey but loves doing all styles. He is currently tattooing out of Statham, Georgia. Click his photo to check out his work! Rich tattoos out of Oahu, Hawaii. He has been a self-taught tattoo artist since 1986. He specializes in all types of work: Polynesian, Japanese, black and grey, mandalas, lettering, etc and his own styles. Rich has tattooed at conventions around the world including London, Amsterdam, as well as across the United States. Click his photo to check out his work! Ivan began a traditional tattoo apprenticeship at the age of 18 back in 2004. Around 2006, he became a full time tattoo artist doing flash tattoos while always remaining focused on black and grey tattoo work. In 2014, Ivan relocated to work in a more appointment only studio. His focus is mainly on black and grey tattoo work while venturing into color more as he continues to evolve. Ivan has have been an artist throughout his life and dedicates himself to the craft of tattooing everyday. Click his photo to check out his work! Bubba is a Houston based artist with ten years under his belt and no left hand. He enjoys traditional, neo traditional, realism, and animation styles of tattooing. Click his photo to check out his work! Nathan is a self taught tattoo artist. He has been tattooing for the past 6 years and enjoy doing black and grey as well as traditional work. Nathan really enjoys the art and never plans on stopping. Click his picture to check out his work! Bri tattoos in Arizona. She enjoys doing all types of tattoo styles. Bri likes to create custom designs for her clients that match their personalities. Her passion is tattooing. Click her photo to check out her work! Jake is a well rounded artist from Northwest Indiana that specializes in a mixture of American Traditional, Neo Traditional and New School, as well as other illustrative styles. Click on his picture to see his work! Joshua has been tattooing since 2011 and his style of choice is black and gray realism. He is based out of Palm Coast, Florida. Click his photo to check out his work! Jonathan has been a tattoo artist for the past 5 years. His focus is on black and gray realism. Jonathan believes what separates him from other artists is that he prefers to customize and draw out all of his work, the reason being that he prefers that the client has a piece that means something more than just a cool idea. Its all in the detail, why join the rest when you can be unique. Click his photo to check out his work! Josh B. has been tattooing for over 5 years now and enjoys and specializes in black and gray realism but is not limited to any single particular style. He is a based in central Jersey working out of Capital Ink. Click his photo to check out his work! Damian is an award winning artist and has been tattooing professionally since 2016. Damian is a street shop artist working out of Louisiana and enjoys black and grey styles as well as some occasional color pieces. Click his photo to check out his work! Roxy has been tattooing full time in Utica, MI the last 4 years. She specializes in watercolor but also enjoys blackwork, illustrative, neo-traditional and realism. Click her photo to check out her work! Soni has been tattooing professionally since 2017. As a well-rounded artist he naturally enjoys tattooing all styles, his favorite being Black & Gray. Click his photo to check out his work! Big Rod is a well rounded artist that can pretty much handle what ever walks through the door of his shop that he opened in 2006. He does however favor large tattoos, as well as B&G tattoos. Click his photo to check out his work! Jesse is a Milwaukee native born on the south side but has lived all over. He’s been tattooing for eight years, airbrushing for sixteen and have been honing his digital art and photography skills for the last three years. Jesse prefers black & grey tattoos but can appreciate color work as well. Click his photo to check out his work! Mikey is a well rounded artist but considers his favorite style as neo traditional. Working in different studios on the East Coast has taught him many different ways to tattoo different styles Click his photo to check out his work! Chuck Wynn Jr has been tattooing professionally since 2014. He is a resident artist at Smokin Guns Tattoo in Beckley WV. The styles he prefers to work in consist of black and grey realism/surrealism, dark art, and neo traditional. Click his photo to check out his work! Kris grew up in Mill City, Oregon, currently has been tattooing for 7 years in Salem. He specializes in ornamental and blackwork. Kris is married and a dad of two, so tattooing motivates him to push himself to the best of my abilities. Click his photo to check out his work! Michael has been tattooing for 10 years. He tattoos a little bit of everything but his primary focus is on dark black and grey. Click his photo to check out his work! Dave has been tattooing in and around Buffalo, NY for the last 5 years. He is mostly self self-taught and has been lucky enough to have a couple friends /mentors that helped along the way. Dave enjoys black and grey as much as the bright, bold color pieces & lettering. Currently, he prefers a mix of traditional with a little twist on it as well as some fun lettering and large-scale color and black work pieces . Click his photo to check out his work! Jeff has been tattooing since 2013. He loves the bold lines and bright colors of new school tattoos but also enjoys black and grey as well as other styles. Click his photo to see more of his work! Eddie started tattooing in the Bronx in 2009. Tattoos and BMX was his only way out. Now he owns American.ink.lu and lxbbmxgoods in Luxembourg. He’s an around tattoo artist but sure loves black and grey realism and neo traditional. Click his photo to check out his work! Jaime has been tattooing for 3 years. He considers himself a versatile artist and is confident working several styles; however, his favorites are black & gray, neo-traditional, and new school. Jaime has a passion for tattooing that keeps him pushing forward and always seeking the opportunity to learn something more. Click on his photo to check out his work! Mac is a southern CA based tattoo artist who can tattoo a wide range of styles specializing in fine line, dark art, realism and custom lettering. He has been tattooing professionally since 2015, click his photo to check out his work! Nikki current focus is making people feel good in their skin again through cover up work on existing tattoos or scars. She has an affinity for geometric patterns incorporated with beautiful flowers as well as feminine faces. Click her photo to check out her work! Michael has been tattooing for a couple years. His enjoys doing bright color new school tattoos and fine art graphite and charcoal drawings. Michael spends a lot of time honing his craft and trying new styles. Click his photo to check out his work! Chris picked up his first machine at twelve years old and from then on tattooing was not only his hustle, but his passion. At the age of eighteen, he joined the United States Marine Corps and was a Marine by day and a tattoo artist by night. Upon completion of his military service, he relocated from Hawaii to North Carolina to open his own shop, Capones Parlor and Tattoo Crew. Tattooing for Chris is more than a trade, it is a culture in which he is very honored to be able to express himself artistically. Since opening his shop, Chris has married and had two amazing children. Chris specializes psychedelic realism and photo realism. Click his photo to check out his work! Ray has been tattooing for 3 years and is well rounded but prefers any color tattoos especially watercolor and new school tattoos. Click his photo to check out his work! Glue tattoos out of Woodbridge, VA. He considers himself a well rounded artist but prefers doing new school and black and grey realism. Enri his a self taught artist. He first sunk his teeth into art in the graffiti scene at 13 years old and has incorporated it into his tattooing. Enri’s preferences are black and grey and new school but does not keep himself from trying bigger and new ways of expressing himself. Click his photo to check out his work! Charlie is from South Carolina, he’s been tattooing for 5 years specializing in realism and neotraditional. He left his occupation as an electronic engineer to explore tattooing as a full time career and never looked back. Click his photo to check out his work! Josh’s specialty is black and grey tattoos including portraits and realism. Click his photo to check out his work! Jose has been tattooing for over 20 years. He has an infinity for neo traditional, traditional and geometric work and has won numerous trophies for his traditional tattoos. Jose likes to play around with different textures and colors to make a completely unique piece every time. He always does custom artwork specific to the client’s needs and wants in his own style. Steven was born in Mexico and his family decided to move to the U.S so they can live the American Dream, residing in Palmdale, CA. Steven has always had a love for art. In 2014, Steven had the skill set to begin tattooing professionally and has been tattooing since, joining the SD Tattoo team in the beginning of 2018. Steven specializes in full color traditional, cover ups, and black & gray. He enjoys doing a little bit of everything to challenge his skills, he is full of ambition and wants to further his skill set. Click his photo to check out his work! Andy has been tattooing 18 years. He specializes in black, and grey/realism. Andy enjoys tattooing skulls, wildlife images, and portraits. Click his photo to check out his work! 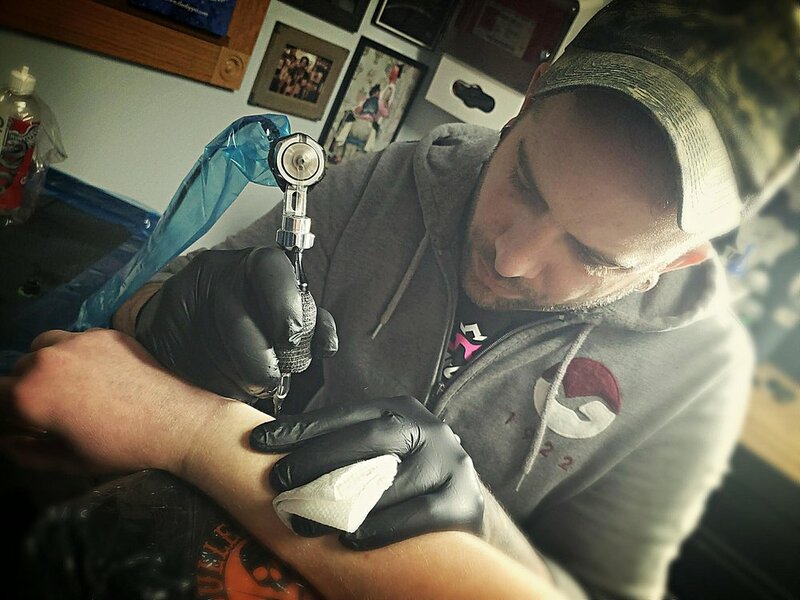 Mike was born and raised in Alexandria, Virginia and has been tattooing for 4 years and piercing for 13 years. He considers himself a well rounded artist that is always down to learn new styles. Mike has affinity for sacred geometry, black work, and neo traditional. Click his photo to check out his work! Kelly was born and raised in New Jersey and has been tattooing for 4 years. She likes to do pretty much any style but enjoys doing animal and nautical themed tattoos. Click her photo to check out her work! Tori has been tattooing since 2007 and has been in love with the industry every step of the way. Originally from Hawaii, he currently lives in WA and tattoos out of Timeless Tattoo in Monroe, which is owned by his best friend Mike Phillips. Tori has done a wide range of styles but mainly specializes in custom and realism pieces. He is mainly known for black and grey that has a hint of flare to it. Tori likes to push himself everyday to become a better artist and can’t wait to see what the years to come will bring. Click his photo to check out his work! Daniel is tattoo artist from Detroit, Michigan, tattooing for 6 years and specializes in black and grey work. He draws 100% of his own tattoo designs and says that his tattooing style is his based on his art. Click his photo to check out his work! Rick is the owner of Bad Buddha Tattoo in Ashland, KY. He been tattooing professionally for 14 years and enjoys all styles of tattooing and but his heart is in black and grey and realism. Derek has been tattooing for 7 years. He works in a street shop called Clover Tattoo in Des Moines, IA. Derek dabbles in most styles but his favorite style to do is American Traditional as well as black and gray work. Click his photo to check out his work! Alexandria is 24 years old and owner of Inked & Spellbound. She is a double Fine Arts major at the University of Nebraska at Omaha. Alexandria have been tattooing for 3 years and can work in any style but prefers photo realism and neo traditional styles. She is also a photographer, tattoo model, and oil painter. Her free time is spent with her dog and anything that’s art related! Click her photo to check out her work! Joel has been tattooing for 2 years and is well-versed in all styles, but his preferred styles are realism, neotraditional, and new school. If you’re looking for someone artistic and detailed oriented, he's the artist the for you! Click on his picture to check out his work! Justin is a free hand Polynesian/ black and grey artist. He’s a well rounded artist, tattooing all styles of tattoos. Click his photo to check out his work! Born and raised in southern Cali/Denver CO, and currently living in Madison, WI. Brandon has been tattooing professionally for 7 years. He is typically known for his unique style of stipple/dotwork, mandala, black and grey/color, and sacred geometry. His art takes its form through various symbols, yantras, yoga/energy, Hindu/Buddhist and eastern religious/philosophies to create unique, one-off completely custom and extremely personal images/motifs that resonate deeply within the collectors soul. Click his picture to see his work. Cristian Altamirano has been tattooing for 8 1/2 years. He specializes in black and grey realism and custom lettering, he also does all types of styles to make himself more versatile including styles from color realism to cover ups. He always wants to push his limits. Click his picture to check out his work. Max specializes in black and grey realism, morphing, as well as dark imagery. Click on his picture to see his work. Sly is a tattoo artist from Shreveport, Louisiana. He has been tattooing close to 10 years. His style of choice is photo realism. Click on his picture to see his work. Zack is a multi-award winner artist, he specializes in full color Japanese. His studio is in Bournemouth, UK. You can normally catch him at the conventions in the summer around the south coast of the UK. Click his picture to check out his work.